While tmux provides much better functionality than screen, most of us that work with tmux have been using screen for a long time, and it is more comfortable for us to use ctrl-a than the default ctrl-b, which is finger-strechy. 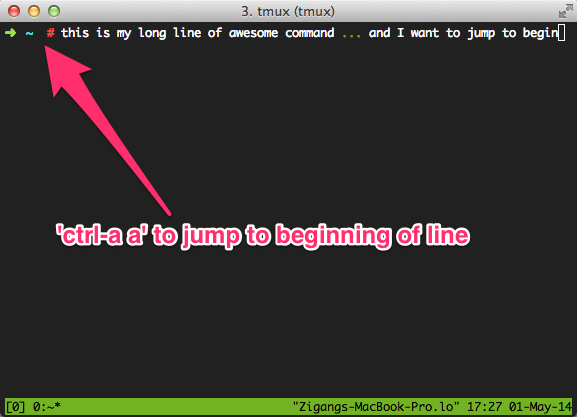 Thus the first thing I will do after installing tmux is to rebind the prefix to ctrl-a. That gives us the most handy way of swapping last two windows by typing ctrl-a ctrl-a. However, this comes for a price. That is, in a shell environment that is integrated with readline, ctrl-a is used to jump the begining of line. Now that it is mapped as prefix, we can no longer do that.